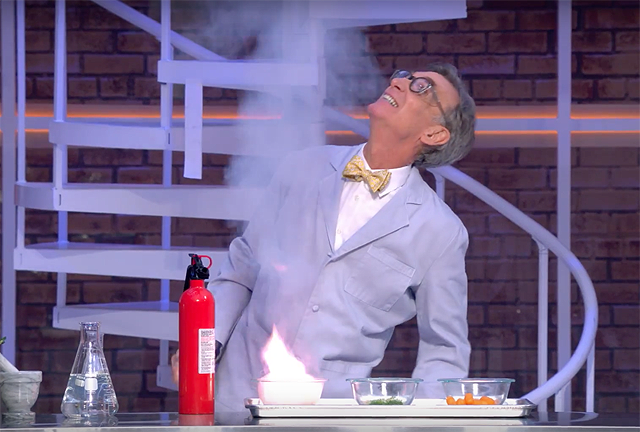 Netflix has revealed the series trailer for their new talk show, Bill Nye Saves the World, hosted by the famed scientist, engineer, comedian, author and inventor that will launch on the streaming service on April 21. Each episode will tackle a topic from a scientific point of view, dispelling myths, and refuting anti-scientific claims that may be espoused by politicians, religious leaders or titans of industry. Bill Nye Saves the World will mark Nye’s long-awaited return to TV since first emerging as a household name in the 1990s as the creator and star of the Emmy award-winning syndicated television show Bill Nye the Science Guy, which ran for five seasons and introduced millennial audiences to science and engineering. In Bill’s unfiltered style, he will bring in special guests, conduct experiments and demonstrations, and ultimately let the facts lead the argument. Bill Nye Saves the World is produced for Netflix by Bunim/Murray Productions. Gil Goldschein and Julie Pizzi serve as Executive Producers for Bunim/Murray Productions. Michael Naidus (The Late Late Show with Craig Ferguson) serves as showrunner and Executive Producer. Writer and standup comedian Mike Drucker serves as Head Comedy Writer; and, astronomer, author and award-winning science communicator Phil Plait serves as Head Science Writer. Bill Nye is an environmental advocate, television host, and licensed mechanical engineer with over two decades of successful public advocacy. As creator of the Emmy award-winning syndicated television show Bill Nye the Science Guy, he became a household name while introducing the millennial generation to science and engineering. Known as a champion of scientific literacy, Bill has challenged climate deniers, creationists, and other opponents of evidence-based education and policy across multiple media – including television, social media, and with his two recent books, “Undeniable: Evolution and the Science of Creation” and “Unstoppable: Harnessing Science to Change the World.” Since 2010, Bill has served as CEO of The Planetary Society. In 2015, Bill Nye added fashion designer to his résumé teaming up with Joe Boxer Founder Nick Graham to launch a limited edition capsule collection based on his iconic sartorial look: the bow tie. With every bow tie sold from The Bill Nye x Nick Graham collection, 10% is donated to The Planetary Society.